Enlarging graphics for meetings, and events can be done as well. 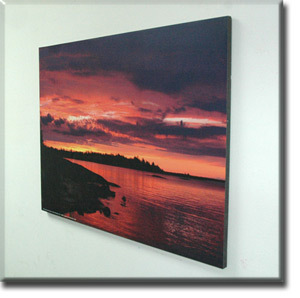 We can take your image or design, add graphics, and laminate the image to foam board. If you are interested in this service please call or contact us and we will be happy go over the options with you. Level 1- Remove minor dust and scratches, minor warts & scars, color correction. Foam board is an extruded polystyrene foam board bonded between two layers of Luxcell wood fiber veneer. Foam board excels where light weight, strength, rigidity and warp resistance are a must! NOT FOR OUTDOOR USE. PVC Foam board is a very durable product. PVC Foam is for photo mounting, display construction and a variety of other uses. PVC board is one of the heavier materials we use but, it stands up well to the outdoors. Custom Edge Colours. If black or white edges are too simple for you, then take advantage of our custom color edge option. We can colour the edges primary colors such as red and blue or you can bring us in a fabric or paint swatch that you would like us to match. Premium Coating. We do offer an extra layer of protection which gives your prints extra years. 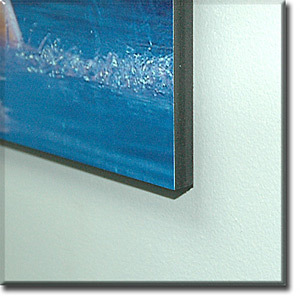 As an extra option we can coat your canvas with a liquid protective shield. With the coating you have the option of give a slightly more glossy appearance or egg shell finish. Custom Sizing & Shapes. If you don’t see the size you wish or require a special shape then please contact us for a quote.